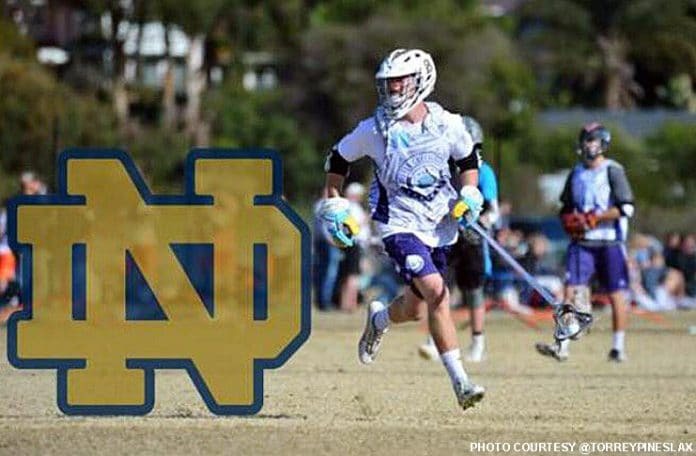 Jonathan Ford, a sophomore LSM at Torrey Pines HS, recently announced his commitment to attend and play lacrosse at the University of Notre Dame. Ford’s brother, Christian Ford (Bishop’s), is a freshman at Michigan. The brothers are grandsons of former U.S. President Gerald R. Ford. Jonathan “Juanny” Ford said he chose Notre Dame for the opportunity to play under a great coaching staff at an elite university. Ford becomes the second Southern California player to commit to Notre Dame in the Class of 2019, following midfielder Max Manyak of Oak Park. With three high school seasons remaining before heading off to South Bend, Indiana, though, the 5-foot-11, 165-pound Ford has his sights set on helping Torrey Pines win a San Diego Section title. The Falcons have fallen to Poway in each of the last two title games.